The Stanislaus Business Alliance is going through a lot of changes and they felt that this would be a good time to rebrand as well. Their new brand, “Opportunity Stanislaus” says a lot about where they were going as an entity. A local design house picked up the project with 15 months to the deadline and did very little work for 13 months. So the Alliance came to us to clean up the mess the other group had made. We began this project with a re-analysis of what was needed for the client and a lot had changed in 13 months. As they drew nearer to the changes that were causing the rebranding their objectives and their perception of their new position in the Stanislaus County business community had changed. This is often the case, so while it was not nice to get a huge project dropped into our lap two months from rollout it was nice to get the final revision of scope at the beginning of our work. During our meeting we talked about the potential visitors to the site and how to break them up into groups. 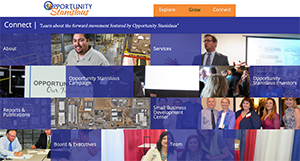 We came up with four: businesses looking at relocating or opening an office/plant in Stanislaus County, workers considering a job in Stanislaus County, locals looking for more information about Stanislaus County, and those considering investing in Opportunity Stanislaus. Our objective was to make sure that the site clearly served all four groups. We wanted something bold and different for this website. So we decided to play with the menus to make that piece unique for the site. Heather Rapinchuk was the lead developer on this project so her and I took a look at this and came up with something we think is both striking as well as beautiful. The menus are full screen and tell a story all their own. I guess you need to see it to appreciate it so go visit the new Opportunity Stanislaus website and take a look. We also wanted one page that stood out for the site. 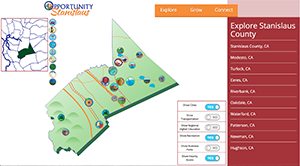 We decided that the map of stanislaus county would be the best possibility for a standout page. Again, we feel as if we have knocked this one out of the park, let us know if you agree. We have met our deadlines and the client seems extremely happy with our end result. Check it out for yourself, do you think we served this client according to our values?